Buying A New Home While Trying To Sell Your Home. NSH Mortgage has the wisdom and tools to help you in buying a home while you’re selling your current home. The easiest way to transition from an old property to a new one is to buy the new one, move, and sell the old one. However, buying a home that way is not always possible if you need the profits from the sale for your current down payment, or if you cannot qualify for a new mortgage since you are still paying off your old mortgage. If you find a property that you must have before your old one sells, you do still have some options available to you to choose from. In a perfect world, you would buy a new home, move, and then sell your old home. Unless you are fortunate enough to have the financial ability to pay off two mortgages at once, though, this may not be an option. The first step is to meet with a knowledgeable mortgage lender to determine whether you can buy before you sell. If this is not an option, you will need a backup plan. The second step is to speak to a real estate professional to review the value of the home you are trying to sell, and the best strategies for selling it. Then you should begin looking at homes in neighborhoods that you would like to buy a home in. Then afterwards you need to organize a plan with your lender and your agent on the best ways to structure the logistics. If you get your old home under contract during the escrow of the new home, you may end on closing them both at the same time. But there are other options available to you. If you do not have the financial means to buy a home before selling your existing home. You should not fully commit to buying a new home before selling your current residence. One option is to make an offer, subjected to the sale of your current home this is called a contingent offer. The contingency is an event that must take place before you can complete the sale. Here, you must sell your old home to buy the new one. This may be an effective strategy, however, especially in a hot real estate market, some sellers will not be willing to consider this option. Making an offer with an extended closing date is like buying yourself some time to sell your current home. 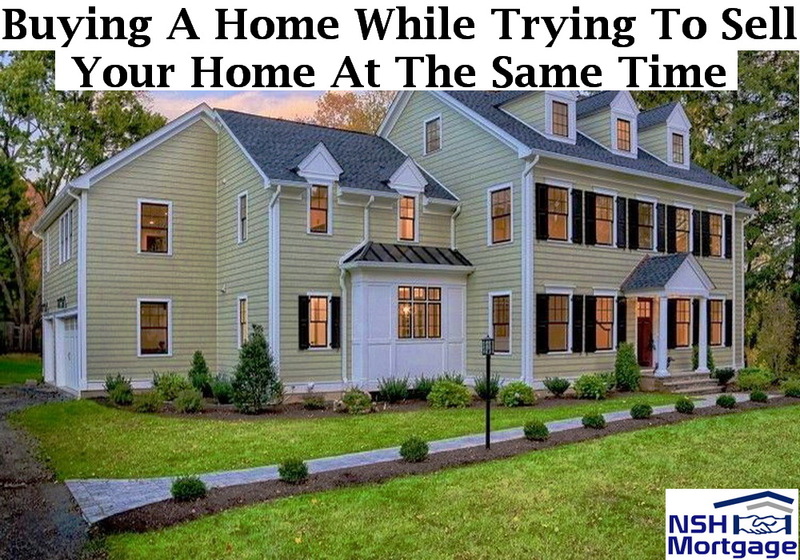 Once again, this is easier when you are not in a hot real estate market, where the buyer may be receiving multiple offers with quick closing dates. Just know you may need to make your offer more attractive to the seller. This can be done with an additional earnest money deposit, or a slight boost to your offering price. Bridge loans can be a great alternative, and is very popular in certain types of real estate markets. A bridge loan is a temporary loan that can help you bridge the gaps between the sales price of a new home mortgage and a home buyer’s new mortgage. You will need plenty of equity, as bridge loans are secured by the home buyer’s current property. If you need to sell your old house to complete a new purchase, you may end with a simultaneous closing. That means your sales and purchases will also close on the same day. Buying a home this way can be a little tricky, but if you hit your deadlines carefully, you can pull it off. While you, your real estate agent, and your lenders are currently working together and moving in the same direction, buying and selling a home concurrently can happen. For this, you absolutely want to be pre-approved before you make on offer on the new home. And you want the buyer of your old home to be pre-approved as well. The last thing you need here is a loan falling through. One way to improve the likelihood for a smooth simultaneous closing is to use the same title company and escrow company, or closing attorney, for both buying and selling. Using one company keeps all the paperwork in one office. It can minimize wire transfer fees, and opportunities for something to go wrong. You may even be able to negotiate smaller escrow charges and / or a discount on your title insurance.